Closure of the plants would reverse emissions benefits gained over the last 25 years from all renewable generation in the region; total zero-emission generation in region might not return to current levels until 2032. A new report highlights potential for higher electricity costs for local residents, lower GDP, and fewer jobs in the region. 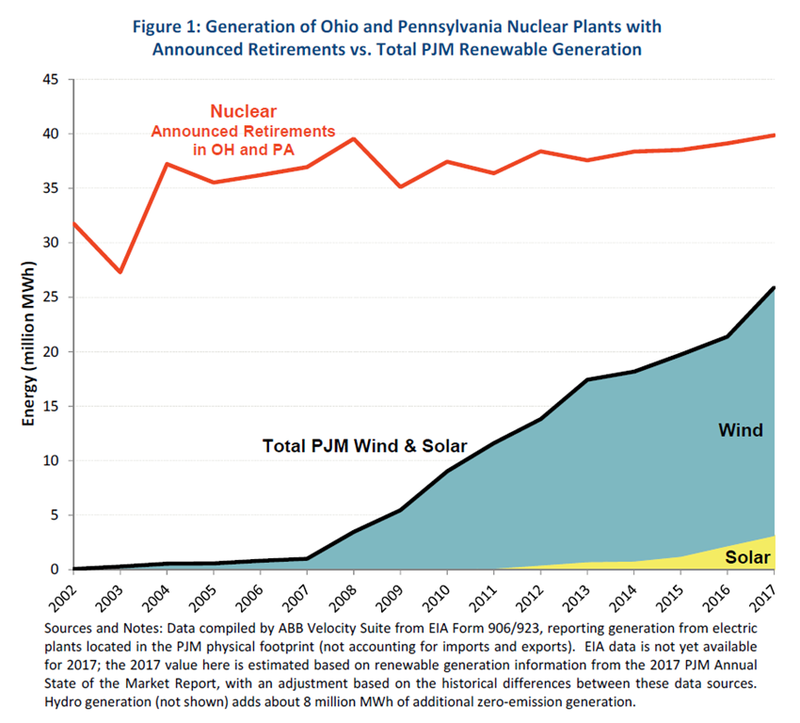 Some advocates for closing nuclear plants in Ohio and Pennsylvania claim that renewables can make up the difference. This is incorrect as both solar and wind power are highly variable. The majority of lost power generation capability would be made up, if needed, by natural gas plants. 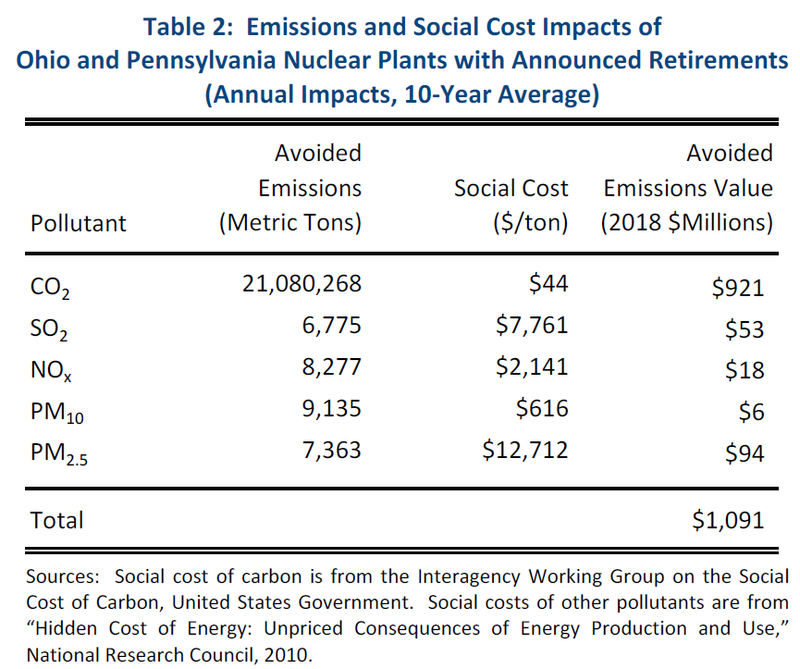 The announced closure of four nuclear power plants in Ohio and Pennsylvania will have severe environmental and economic impacts, according to a new report released on 4/16/18 by The Brattle Group. Specifically, these closures would likely result in an increase of over twenty million metric tons of CO2 emissions, tens of thousands of tons of incremental air pollutants, and significantly higher electricity costs to consumers. It would also put hundreds of millions in GDP and thousands of jobs at risk for residents across Ohio, Pennsylvania and the broader region. Eliminate tens of millions of dollars in local tax revenues. As western Pennsylvania and eastern Ohio are centers of natural gas production, due to the use of fracking drilling methods, the construction of these plants near these resources would inevitably be attractive to investors. There is an element of the nuclear industry, especially among developers of small modular reactors and advanced designs, that are building in “load following” for the plants. Most large nuclear plants, especially those built in the 70s 80s, run at 100% capacity all the time. Full size nuclear power plants can do load-following over a 24 hour period. Nuclear power plants operating in the load-following mode follow a variable load program with one or two power changes every 24 hours. The load pattern is determined by the grid operator and the utilities, depending on the power demand and the maneuvering capabilities of the plant. Load following would allow these reactors to generate electricity at lower levels of utilization during the day, if wind and solar are putting electricity into the grid, and at higher rates at night, or when weather is a factor, etc. In either case, the nuclear plants can have the key role of keeping the grid stable to address the variable nature of renewables. The PJM is the largest electricity market in North America, covering all or part of 13 states including Ohio and Pennsylvania, and spanning from Illinois to New Jersey and Virginia. The loss of these plants would quickly reverse the environmental benefits of all the PJM wind and solar resources developed in the region over the past 25 years – benefits which were supported with billions of dollars of customer and taxpayer investment through renewable energy credits and federal tax credits. “As this report makes clear, policymakers should take note of the critical environmental and economic contributions of our nation’s nuclear plants, especially where their continued operation is threatened,” noted Brattle Principals and study authors Drs. Dean Murphy and Mark Berkman. Another 15 years, at the current renewable growth rate, for the region to return to the level of zero-emissions generation in 2017. “Thousands of lost jobs, major hits to local tax revenues, higher electricity costs for consumers, and more harmful pollutants – any lawmaker should take steps to avoid such a situation,” said Nuclear Matters Advocacy Council Member and former Senator Judd Gregg (R-NH). “It is imperative that we act to prevent the closures of these four nuclear plants which contribute needed diversity to Ohio and Pennsylvania’s overall energy supply and provide residents a dependable power source in extreme weather situations. Following Vermont Yankee’s shuttering in New England, we saw devastating effects. The loss of tax revenues forced local officials to make major budget concessions to the detriment of their residents, including cutting their municipal budget by 20 percent, drastically reducing police services and raising their property taxes by 20 percent. “If these plants close, the livelihoods of thousands of Ohio and Pennsylvania residents will disappear. The over 3,000 highly skilled individuals directly employed by these sites will leave to seek employment at other facilities still operating around the country,” said Lonnie Stephenson, President of the International Brotherhood of Electrical Workers. “Impact of Announced Nuclear Closures in Ohio and Pennsylvania” was prepared for Nuclear Matters by Dr. Dean Murphy and Dr. Mark Berkman of The Brattle Group. This report follows the recently announced planned closures of Exelon’s Three Mile Island and FirstEnergy’s Davis-Besse, Perry and Beaver Valley plants, a decision the companies attribute to low power prices in wholesale markets and the lack of state and federal relief. “Ohio Nuclear Power Plants’ Contribution to the State Economy” (April 2017) and “Pennsylvania Nuclear Power Plants’ Contribution to the State Economy” (December 2016). This latest report compares the results of these most recent previous studies with sensitivity cases in order to outline various approximations. The group Nuclear Matters® is a national coalition that works to inform the public and policymakers about the clear benefits of nuclear energy. The coalition supports solutions that properly value nuclear energy as a reliable, affordable, safe and carbon-free electricity resource that is essential to America’s energy future. Nuclear Matters engages stakeholders and energy consumers around the country to educate and activate them in support of current and future nuclear energy use and to promote solutions that will help to preserve this essential energy resource. The Brattle Group analyzes complex economic, finance, and regulatory questions for corporations, law firms, and governments around the world. We are distinguished by the clarity of our insights and the credibility of our experts, which include leading international academics and industry specialists.